Community Support is a strange thing to be involved in as a Funeral Director. Most people want some help with their event but when the Funeral Director offers to help, some people run a mile. So its hard sometimes, to be able to even offer help. However we plod along and help where we can. 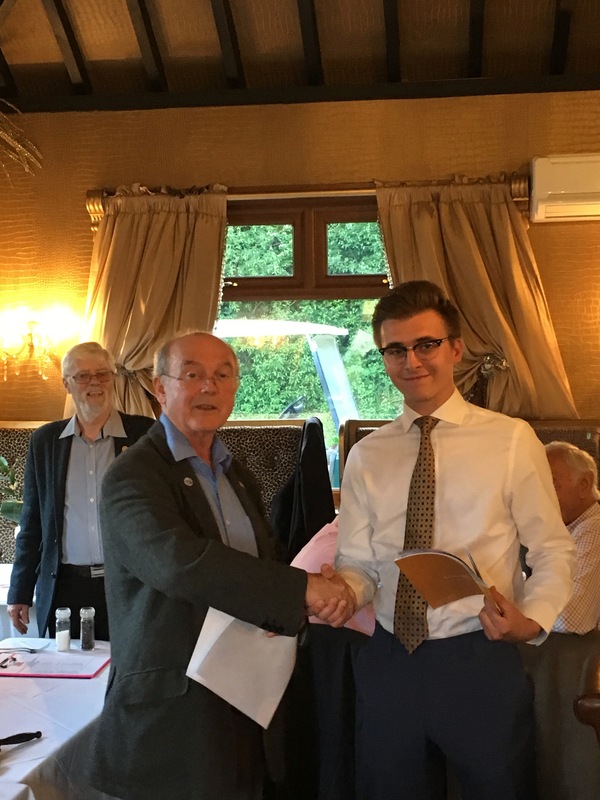 Just before the main Rotary Charity event of the year, my son Robert joined the Rotary Club of the Weald of Kent. I was very excited to be there to see him joining. One day he will be the President! Oh heaven help us all then! Our main community support for this year is again to be the sponsor for the 2018 Weald of Kent walk, which is organised by the Rotary Club of the Weald of Kent for the benefit of Cancer Research and other charities. The walk is on Sunday 10th June 2018, and you can take part in either the 1,3,6 or 9 mile walks. Take the dog and have a good lungful of Kent fresh air! Rotary clubs around the country do lots of community support and are a great way to meet new people, try it, they don’t bite! Meet at Harrietsham Village Hall at between 8 and 11am, sign in and off you go. It will cost you £15, but you will get our great encouragement as you walk around, and a Ploughman’s Lunch, a punnet of strawberries, and entertainment from a Jazz Band when you get back. We also sponsored a Charity Cricket Match in aid of Help for Heroes, which was organised by the Weald of Kent Rotary Club and took place on 8th July at Sutton Valence. Sadly it clashed with the County Show, Wimbledon and something about football! So it wasn’t as well supported as it might otherwise have been. I think it will be a feature of the calendar in 2019. 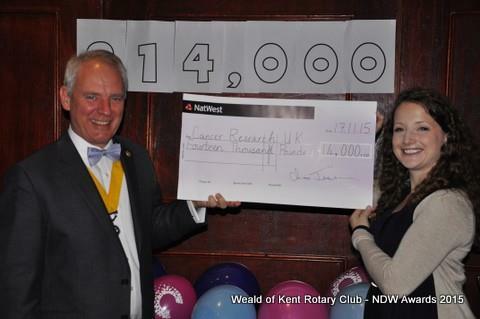 Our main sponsorship for this year is again to be the sole sponsor for the 2016 Weald of Kent walk, which is organised by the Rotary Club of the Weald of Kent for the benefit of Cancer Research and other charities. The company sponsorship will be £3300. The walk is on 22nd June 2016, and you can take part n either the 3,6 or 9 mile walks. Take the dog and have a good lungful of Kent fresh air! Rotary clubs around the country do lots of community work and are a great way to meet new people, try it, they don’t bite! This year the Rotary Club passed a huge milestone. To date it has raised £500,000 for various charities. 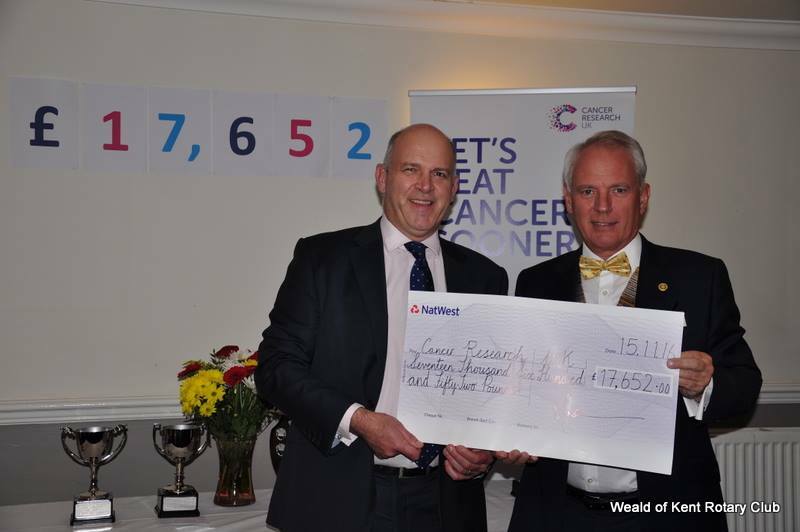 As I am the club President this year, I was able to present the cheque to Cancer Research myself. What a terrific achievement for everyone who walked. As in all Rotary Clubs, everything goes to charity except expenses. Family Funeral Service covered all expenses so everything went to the charity. The company again decided to adopt the main sponsorship for this year to be the sole sponsor for the 2015 Weald of Kent walk, which is organised by the Rotary Club of the Weald of Kent for the benefit of Cancer Research and other charities. Our sponsorship will be £3000. The walk is on 22nd June 2014, and you can take part n either the 3,6 or 9 mile walks. Take the dog and have a good lungful of Kent fresh air! On the Presentation Evening, the President was unable to attend so I had to step in and do the fun part. Presenting cheques and cups to Cancer Research and the various walkers with the highest sponsorship. Our main sponsorship for this year, and we are pleased to be able to say that we have agreed to be the sole sponsor for the 2014 Weald of Kent walk, which is organised by the Rotary Club of the Weald of Kent for the benefit of Cancer Research and other charities. Our sponsorship will be £3000. The walk is on 22nd June 2014, and you can take part n either the 3,6 or 9 mile walks. Take the dog and have a good lungful of Kent fresh air! Rotary clubs around the country do lots of community work and are a great way to meet new people, try it, they don’t bite! It was very exciting to be able to say that we have agreed to support the Guide Dogs again this year, as its such a fabulous thing these dogs do. And the training they are given is just amazing. I had a go at something they call “Sighted Guiding” the other day, when the Maidstone Guide Dog Trainers were at Maidstone Grammar School for Girls to do some training there. It was quite and “eye opener” in fact! We are very pleased to be able to say that we have supported the Heart of Kent Hospice http://www.hokh.org/ with just over £20,000 over the last few years. They do such excellent work there, that we always feel we should do what we can to help them along. This money is from the operating profit of the business. They DO NOT recommend our services to relatives, in fact many of the staff there are completely unaware of these gifts, and in fact we don’t have many funerals from the Hospice. 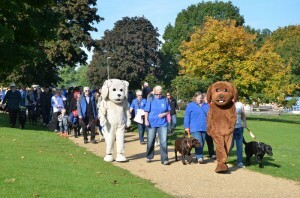 On 7th October 2012, we sponsored the Guide Dogs local event “Go Walkies” in Mote Park. 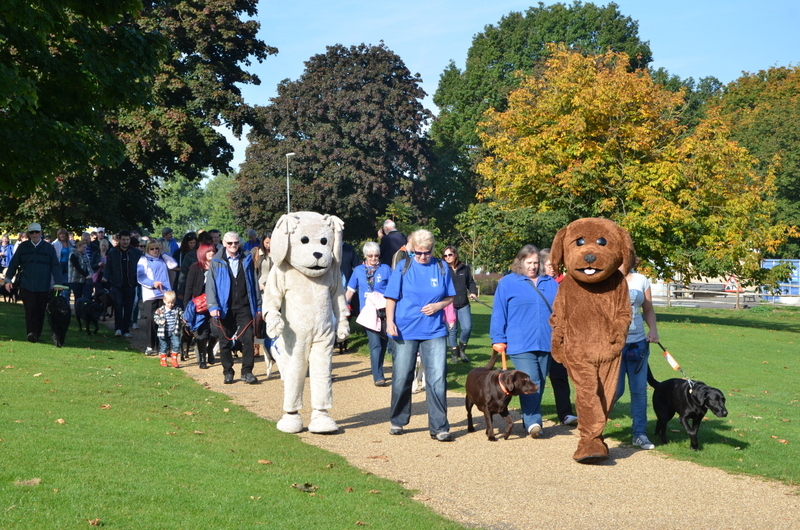 Very fortunately, the weather was kind, and lots of very lovely people came out to support Guide Dogs Maidstone, and have a lot of fun at the same time. 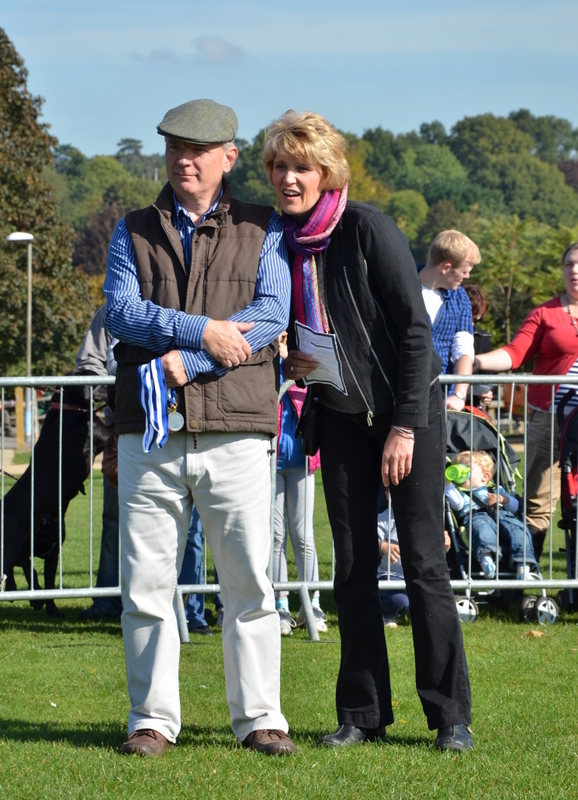 Rather embarrassingly for me, I was pressed by Kate Hunter (thanks Kate) into judging the Fun Dog Show. I will shortly be adding some pictures. This has to be one of the most difficult things I have ever had to do. I was lucky to have a lovely lady Vet with me. We had a lot of fun. 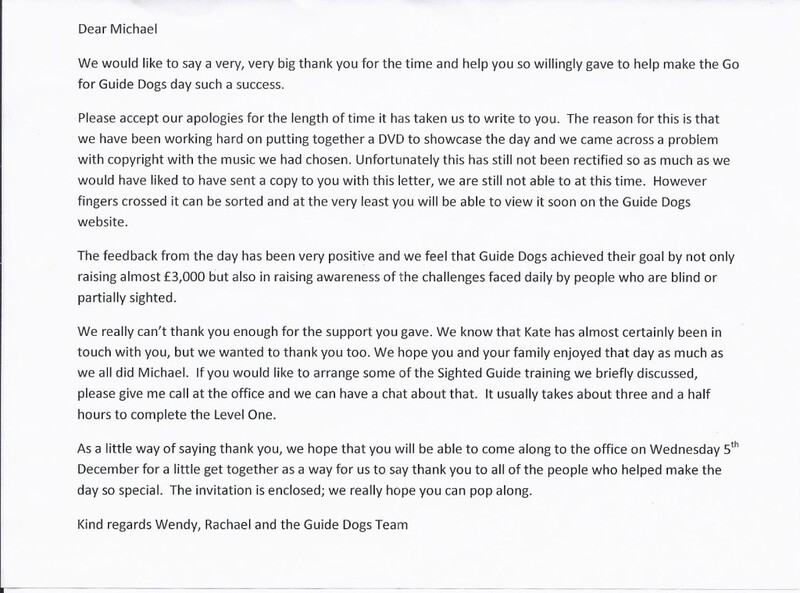 They raised £3000 that day for Guide Dogs. 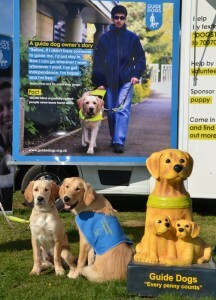 Well done Maidstone Guide Dogs, and the event organisers in particular. This was the very long 1 mile sponsored walk! And yes they did do it too. A very funny thing happened. The Guide Dogs event staff asked me and their Veterinarian (who was a lovely lady and I will add her name as soon as I can find it) to do a fun Prize giving for classes like “The owner who looks most like their dog”. The dog with the most “I didn’t do it” look. Best “Senior Citizen” and several other “classes”. If you were one of the spectators I hope you will agree that it was mostly an impossible task. Everyone who took part was a great sport. Well done to everyone. Fun, absolutely! We have also given to the local Scouts in Barming, and the local football team. We have given our support to some of the churches in and around the town too, because as you can imagine we go to them rather a lot. We have recently (July 2012) donated a £1000 to assist with the organ restoration at St Peter and St Paul’s Church in Aylesford and also £1000 to help have the bells restored at St Margaret’s Church in Barming. Both are good causes and once restored will give people pleasure for many years to come. On Saturday 7th July 2012 St Margaret’s Church baring is holding an scarecrow festival on the parish field from 12noon until 5pm. We have donated £200 towards this event. Information for this event can be found at www.stmargaretsbarming.org.uk. Since then we have promised £2000 towards church bell refurbishments. A couple of years ago, my wife and I arranged a fun run in Mote Park Maidstone. It was for the Orchid Cancer Appeal. http://www.orchid-cancer.org.uk/ Perhaps a little cheekily the run was titled “know your balls” as the charity specialises in male cancer research! There are lots of runs and walks for ladies cancer charities, so we thought we would do something for the men. It was rather a laugh at the start. The Mayor was there giving all these tough looking guys a briefing about the importance of checking themselves for anything unusual “down there” Lots of coughing and spluttering followed along with lots of red faces, and of course wives and girlfriends all falling about laughing.Then they were off! It was five miles around the park and they all seemed to have a good time. Lots of good natured pushing and shoving took place. We raised just over £2000 that day, so we went home tired but quite pleased. Once they were off, we realised that we had lost our son Robert. Then the first marshal radioed that he was “keeping up with the men” on the run. Phew!